Tracy writes contemporary realistic middle-grade and young adult fiction plus nonfiction for the education market. When she’s not playing with words Tracy enjoys trail running, hoop dancing, and bird watching. 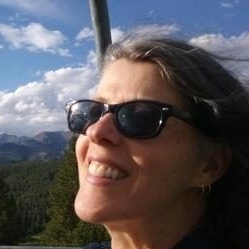 She’s a longtime member of SCBWI and loves the supportive and generous kidlit community. Tracy is represented by Amy Bishop of Dystel, Goderich, & Bourret and is honored to volunteer as Coordinator for the Michelle Begley Mentor Program.